CHICAGO, IL--(Marketwire - October 18, 2010) - The American Academy of Ophthalmology and its partners today announced the expansion of a new screening initiative, EyeSmart® EyeCheck, to combat undetected eye disease and visual impairment among at-risk populations in the United States. 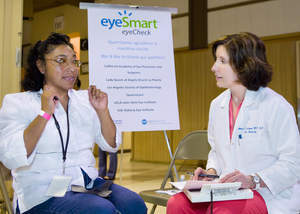 The free vision screening pilot program will come to Chicago, Miami and San Antonio in 2011 and 2012. "Our goal with EyeSmart EyeCheck is to raise awareness and understanding of the impact of eye disease and visual impairment, particularly among minority populations who disproportionately lack access to care," said David W. Parke II, MD, CEO of the American Academy of Ophthalmology. Testing a screening methodology for adults, focusing on detecting damage from eye disease rather than screening for eye disease. Studies suggest that this approach may work. The incidence of multiple diseases in the Latino community and in other at-risk populations is what prompted the Academy to adopt and promote a different approach to adult vision screenings. "Traditional adult vision screenings typically screen for a specific disease like glaucoma or cataracts," said Anne L. Coleman, MD, PhD, director of the Academy's H. Dunbar Hoskins Jr., MD, Center for Quality Eye Care, and the Fran and Ray Stark Professor of Ophthalmology and Professor of Epidemiology at the UCLA Jules Stein Eye Institute. "To get the greatest benefit from a screening, it makes sense to screen broadly for functional impairment in a sequential process of elimination. This allows us to screen more individuals in a given time period, much like triage in an ER, where more serious cases are quickly referred on for care." The Academy's EyeSmart EyeCheck program will be working with the Hoskins Center, EyeCare America and local health departments and community clinics to provide sources for care once a diagnosis is made. EyeCare America, a service program of the Foundation of the American Academy of Ophthalmology, offers eye care services often at no out-of-pocket cost to qualifying patients [www.eyecareamerica.org]. Patients are referred to one of nearly 7,000 volunteering ophthalmologists across the country. In addition, EyeSmart EyeCheck will work with local hospitals, community clinics and health departments to steer patients to treatment. Screenings will be coordinated in the three cities by the following organizations. Times and dates of the screenings will be announced in 2011. EyeSmart EyeCheck was announced in May 2010 and was in response to research from the Los Angeles Latino Eye Study that showed Latinos have higher rates of visual impairment, blindness, diabetic retinopathy and cataracts than non-Hispanic whites. The first screening was held in Los Angeles this summer where nearly 500 people were screened by Eye M.D.s in less than five hours. The American Academy of Ophthalmology is the world's largest association of eye physicians and surgeons -- Eye M.D.s -- with more than 29,000 members worldwide. Eye health care is provided by the three "O's" -- opticians, optometrists and ophthalmologists. It is the ophthalmologist, or Eye M.D., who can treat it all: eye diseases and injuries, and perform eye surgery. To find an Eye M.D. in your area, visit the Academy's Web site at www.aao.org. Ophthalmologist Dr. Anne L. Coleman and patient at pilot EyeSmart EyeCheck in Los Angeles.